Peaceful silence fills the largest hall of the Werkstatt der Kulturen. Around three hundred people inhabit its rows waiting for the attention-catching moments they can eternalize with their prepared cameras. Their curious expressions and high expectations come into being without uttering a single sound. Their eyes are fixed on the stage; their gaze awaits the dancing energies of the divine to materialize. Three minutes later, they finally do. Everyone finds themselves in a paralyzing trance of the whirling dervishes and the accompanying, divinely-inspired psychedelic music. Ever since 13th century Persia, the Islamic branch of the Mevlevi Sufi Order has mesmerized, awed and enchanted the spectators of their dance and music. Seven centuries later, on a chilly & gray Berlin afternoon, the Sufi Ensemble Rabbaniyya gathered Berliners of all ages and boroughs to Neukölln and its cultural hub (Werkstatt der Kulturen) for one of the most memorable performances at the intercultural Sacred Music&Dance Festival. The Mevlevi Sufi order was founded in Konya (Turkey) by the followers of the 13th century Persian poet, jurist and theologian Rumi. Also known as the Whirling Dervishes, the Sufis are famous for their practice of whirling as a form of dhikr (Islamic devotional practice of remembrance of God). If you have ever seen a live Sufi performance, you probably wondered what the significance of the Sufi whirling (or spinning) is. Their performance in itself is a form of Sema, or physically active meditation, whose aim is to reach the source of all perfection in the world. 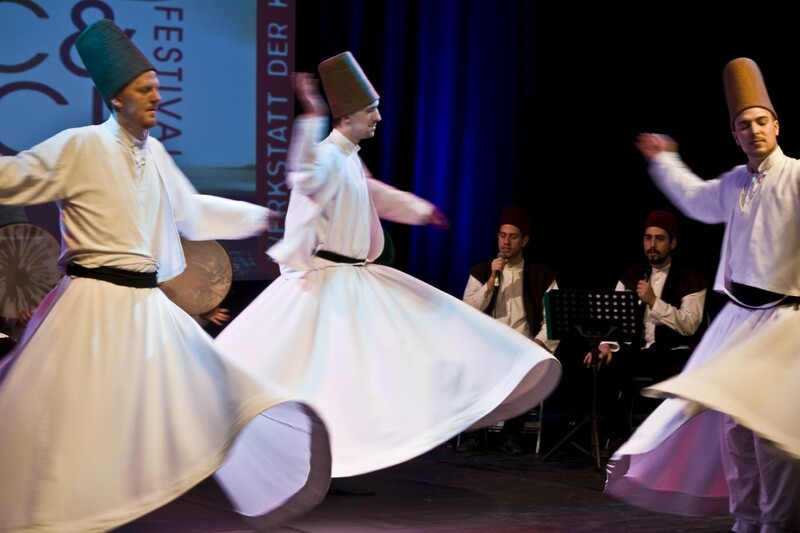 Through their dance performance within the worship ceremony of Sema, the dervishes seek their connection to the Divine by abandoning egos and personal desires, listening to the Islamic spiritual music and focusing on God – which comes about by spinning one’s body in circles. 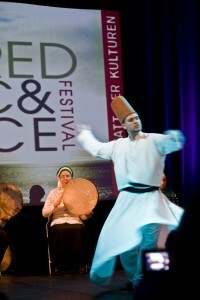 Every part of the Sufi’s performance, from clothing to movement, evokes the symbolism of the Sema ritual. The camel’s hair hat (sikke) represents the tombstone of the ego, while the wide, white skirt (tennure) stands for the ego’s shroud. By removing the black cloak (hirka), the Sufi is spiritually reborn to the truth. 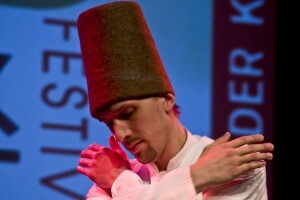 At the beginning of the ritual, the dervish holds his arms crosswise as a symbol of his unity with God. While whirling, his arms remain open – the right arm is directed to the sky as connection with God, while the left hand is turned towards the ground. Sufis revolve from right to left, embracing the whole humankind with love in the process. It is extremely difficult to put the personal experience of a Sufi performance into words. Even by merely listening to the beats of the Islamic spiritual music and watching the devoted dance of those—I would dare to call—enlightened ones, one frees oneself from the restrictions of the ego and, at least for that moment in time, feels in tune with the higher powers of being and connected to the energies of the cosmos. 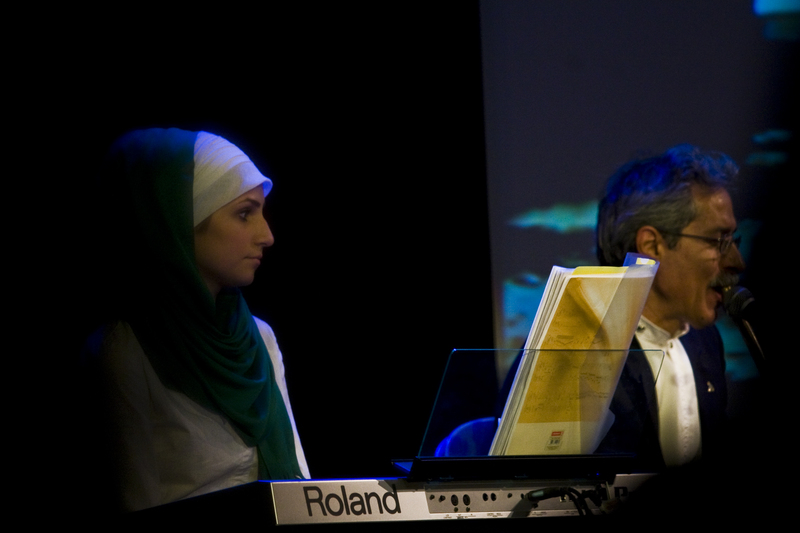 By combining classical Islamic music with poetry and Sufi dance in the tradition of the famous Persian mystic Rumi, The Sufi Ensemble Rabbaniyya from Berlin (a project of the Sufi Zentrum Rabbaniyya Berlin) was successful in conveying the all-encompassing atmosphere of Islamic spiritualism to the audience in the Werkstatt der Kulturen. 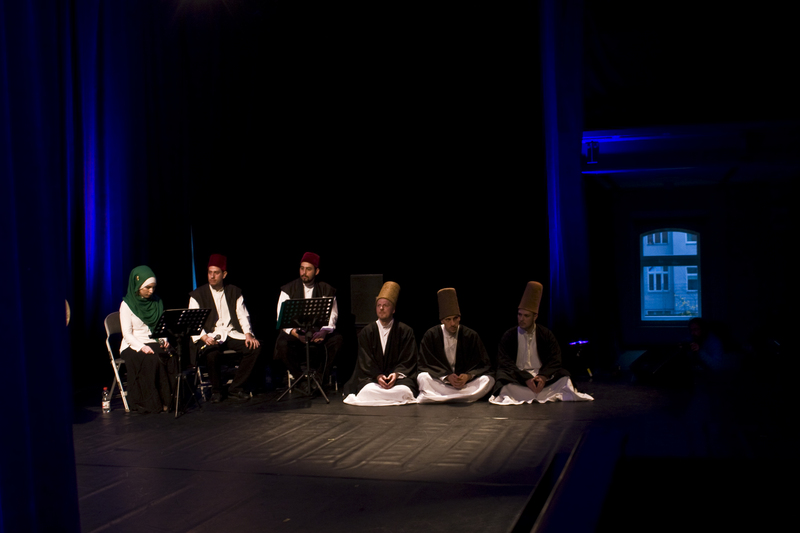 The celestial sounds of their instruments, combined with meditative vocals and penetrative rhythms, took the spectators of this miraculous performance to the multifaceted Middle Eastern world. The taste of mystical bliss, as well as the feeling of infinity the whirling dance conveyed, created a communal energy of inter-connection amongst those who were a part of the experience. Following that vein of thought, it is almost impossible for me to talk about my individual feelings during the performance – I feel it would in fact defy its very purpose. What I felt was just a part of a mutual experience – the sense of union, connection between people, God or any higher energies one might believe in. Very often in everyday life, and more so today, we are caught up in our egos – our social construction of who and what we are, characterized by labels such as “student,” “mother,” “successful businessman,” “failed musician” and so on. These constructions are built up into our existence to such a large extent that at one point they become the only truth there is. In that moment, they transform into the only world we know – a limited world of few possibilities, devoid of spiritual connections and questions that often challenge the material existence. They suppress our natural curiosity and self-challenge to learn more – and to learn alone. Some paths can only be walked individually; from that apparent solitude follows the realization of its mirage, the illusion of aloneness – for we are never truly alone. We are simply unbreakably connected. Connected with the world, other beings, the universe; all those universes that might exist across the one we are familiar with. It is a feeling that does not have to be rationalized. The internal experience it brings is the only knowledge one requires – accepted without prejudice and employed with understanding of the hidden truths. Maybe you are right, oh you, critical reader, taking my words with a pinch of salt. However, before you drop the subject completely, I hope you will go see and feel the dance of the whirling dervishes first. Once you do, if you do not feel the connecting thread of all life forms I mention above – one that I felt in every cell of my body, and saw on each and every face of the Sufi Ensemble members – feel free to completely disregard my words. And if you do, do not feel obliged to tell me. For the Sufi craziness of love I would rather endure than the limited dullness of human life.